Claudia Breitung, author of BICC Policy Brief 5\2017, argues for a clear strategy for the transformation of South Sudan’s security services. According to the largely stalled Agreement on the Resolution of Conflict in South Sudan (ARCSS) of 2015, a key component of the transitional security arrangement is the establishment of cantonment sites where fighters assemble to await disarmament, demobilization or force integration. The cantonment process was supposed to start soon after the signing of the agreement, but due to enormous delays in the implementation of the transitional security arrangements and the return of conflict in July 2016, the process has never taken off. The conflict is ongoing and all sides, including government forces, continue to use violence despite various ceasefire pledges. While the rationale in the Peace Agreement for cantonment and assembly was to separate the warring factions in order to enable a permanent ceasefire, BICC Policy Brief 5\2017 “South Sudan’s stalled Peace Process—Security arrangements in need of adjustment” argues that these factions mainly view cantonment as a tool to reach their respective military objectives. When opposition leader and then First Vice President of the Transitional Government of National Unity (TGoNU), Riek Machar, was still in South Sudan, he aimed at establishing as many SPLA-In Opposition (SPLA-IO) cantonment sites as possible. 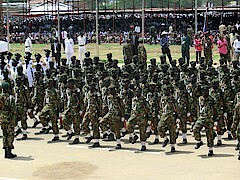 Today, conflict analysts believe that Machar intended to utilize cantonment as an instrument to strengthen his own forces and to extend his military power base.